Over 70% of the world's traffic came from mobile devices in 2018. Google started ranking mobile pages based on loading speed. It's time to unleash the power of your website. We are the lead developers in our niche, with 30.000 happy customers and growing, developing and evolving the speed of your mobile website for more than 10 years. Here are some reasons why are products are the absolute best. We are the lead developers in our niche, with 30.000 happy customers and growing, developing and evolving the speed of your mobile website for more than 10 years. We're fully compatible with all major operating systems, constantly striving to obtain the most out of your mobile device. Optimized to Ludicrous Speeds. Our philosophy is building insanely fast websites with uncompromised features. We code pages for our grandmothers. The code need to be simple, effective and easy to edit by anyone regardless of their skills. Sometimes you get stuck along the road. And that's no problem. We're always here to help our customers! One of the key aspects of users leaving your page is the loading time. According to a Google Statistic, 25% to 40% of users will leave if your page is not loaded in the first 4 seconds. An average responsive website loads in 5 seconds. You could be loosing thousand of visitors. Don’t lose up to 40% of your traffic. 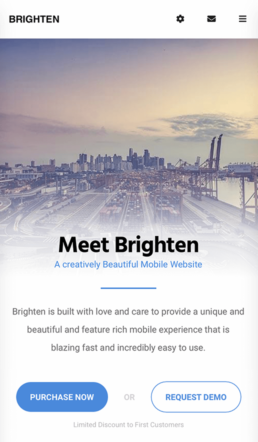 Use one of our Dedicated Mobile Website Templates for your Website. Don’t lose up to 40% of your traffic. 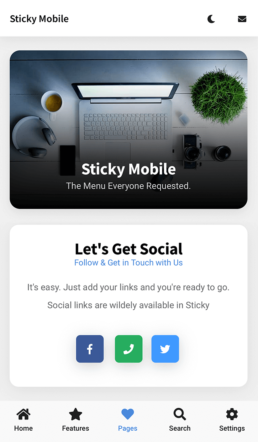 Use one of our Dedicated Mobile Website Templates for your Website. We're the best selling authors of Mobile Stock Items because we treat our customers and our products how we would want to be treated. Our philosophy is to offer the best product and the best support to everyone of our customers. All our products are designed to look gorgeous on high resolution screens. Pixel perfect, crisp design quality is absolutely essential. Always designed to be user friendly, with elements especially created for smooth and fast interaction. Products designed and built to flawlessly and intuitively work with your fingers to obtain a gorgeous user experience. With performance in mind, we build powerful features and give life to designs with smooth transitions and lightning fast loading times. With easy to read, clean code, built and documented for those who have no tech-savvy knowledge. There's nothing more important than having the confidence that someone is always there to help, and you can always count on us to do that. We've established the rank of Elite Author on the Envato Marketplaces for the quality of our products and support. Our products have been featured by some of the biggest developers out there for their quality and performance. More than 25.000 people chose our products with a 4.7 / 5.0 satisfaction rating! We love customer feedback! We're constantly looking for new technologies, and our products always reflect the greatest and best out there. With over 200 products to choose from, you're sure to find your style. Check out our store for and select a navigation style you like, we'll show you all products based on that. We're constantly posting new products, features and discounts! Check them out and stay updated with our products! We're constantly releasing new products, posting news and updates related to the biggest changes affecting mobile browsing! Don't miss out!